A commercial HVAC system is a significant investment for your building, and you take your time in finding the best system to meet all your heating and cooling needs. With equipment that’s so important to your facility, you can’t trust just anyone to handle your commercial HVAC repair and service. All of the Jersey HVAC Pros are industry-leading qualified industrial HVAC contractors backed by the 5-Star Seal of Approval that can ensure your system operates properly, efficiently, and can help extend the lifespan of your equipment. Here are some reasons you should properly vet a contractor before letting them service your system. An experienced technician knows what to look for when something is awry in your industrial HVAC. They have at least 9,000 hours of hands-on training, continuing education, and experience servicing and repairing all types of commercial and industrial HVAC systems and regularly take continuing education classes to learn the latest equipment. Through a system analysis, they can quickly pinpoint and fix an issue you’re having with your cooling, heating or ventilation. They also know how to perform thorough checks and make safety a priority. A less experienced contractor may not only take longer to fix an issue, costing more money, but they may not get to the root of the problem. So while they may fix the obvious issue, they may not have the knowledge or expertise to diagnose a larger issue that could create a safety concern or bigger problem down the road. A qualified HVAC commercial contractor is licensed and well-educated in compliance with local laws, permits for certain projects, as well as how to properly inspect and repair equipment. 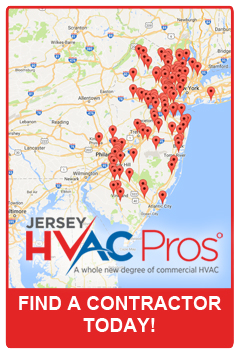 In addition to proper licensing, a contractor should also be a part of a professional service group, like the Jersey HVAC Pros. This ensures you a greater level of accountability, as the contractor isn’t just responsible to you, but to his or her organization. When you have a problem with your heating and air condition, you need the job done correctly and quickly. A qualified commercial HVAC contractor provides reliable service so you don’t have to worry about the system failing. And if you have an emergency, they can assist you quickly and get your system up and running again to minimize disruption. An industrial HVAC system is a large investment, and it accounts for about 40 percent of your building’s energy consumption. A qualified technician can help you maximize your returns on the system by keeping it running smoothly. How do they do this? By helping your system operate efficiently so you can realize significant energy savings. Regular maintenance by a qualified commercial contractor can decrease your energy bills by 15-20 percent. Expert service professionals stay on top of the latest HVAC innovations and energy-efficient practices, so they can also suggest ways you can get even more savings from your equipment. The best service contractors aren’t just about getting a job done and getting out. They want your commercial HVAC system to last for years, so they want to build a long-term relationship with you. When you build a relationship with a service professional, they truly understand your system and your businesses’ commercial heating and cooling needs. They have documentation of service performed, so they know when and what components need to be replaced. They also can provide recommendations specific to your needs. In addition to service or repairs, a trusted technician can also help you plan for strategic upgrades and long-term capital investments in equipment so you can understand and plan for what’s coming down the road. Your commercial and industrial HVAC system is vital to your business, therefore, you need qualified technicians to service it. Jersey HVAC Pros are committed to high standards of service through our 5-Star Seal of Approval which comprises expertise, accountability, reliability, return on investment and trust. We have qualified professionals throughout the state with high standards of excellence ready to serve you.